Get ready for some madness in Peavey’s booth during The 2019 NAMM Show in Anaheim, CA, with a special appearance by internationally renowned bassist Michael Anthony. 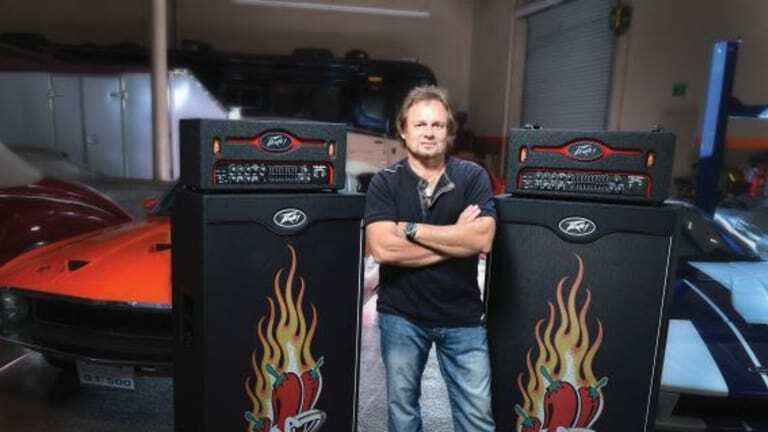 “Mad Anthony” will be on hand to meet and greet fans, and discuss his Michael Anthony Signature Series bass amplifier and enclosures with attendees. It’s all happening Saturday January 26 at 3PM, in Peavey’s booth #201AB. A former and founding member of Van Halen and the current bassist of the supergroups Chickenfoot and The Circle, Michael Anthony has toured the globe, performing before millions of people. He brings plenty of flavor and personality both on stage, with his famous Jack Daniel™ bass guitar, and off stage with his “Mad Anthony” hot sauce brand. In 2009, Peavey decided to spice up a design by asking for Anthony’s thoughts on a new bass amp, the VB-3™, which he used exclusively on tour with Chickenfoot. After sharing his feedback, Anthony was invited by Peavey to create the Michael Anthony VB-MA™ Bass Amplifier. The VB-MA’s 300 W all-tube head packs a low-end punch, while weighing in at an extremely portable 38 pounds. For rock-solid tonal control, the VB-MA is loaded with a true independent second overdrive channel with separate EQ and Master Volume controls. Anthony also added a unique Blend control that enables players to blend between the overdrive and clean channels for even more tonal flexibility. The VB-MA is styled with a striking red backlit panel that features Anthony&apos;s signature chili pepper logo. Along with the VB-3 amplifier, Peavey introduced Michael Anthony Signature Series bass enclosures, all constructed with premium-grade 12mm Baltic birch plywood, and extensively braced and covered in a durable GatorHyde® finish. The MA-410 has a dynamic horn tweeter with level control and 800 W program power handling; the MA-810 can be operated in stereo or mono modes with 800 W power handling; and the MA-118 has nominal impedance of 8 ohm, and a program power handling of 1600 W and 3200 W peak, enabling it to be used in conjunction with almost any sized bass amp head. Learn more about the Michael Anthony Signature Series at www.peavey.com, and if you’re attending Winter NAMM, be sure to stop by Peavey’s booth #201AB to say hello to the man himself.